The efforts by seven staff members to deliver exceptional service and commitment at Tong Garden Centre are being rewarded with an invitation to a prestigious awards ceremony. 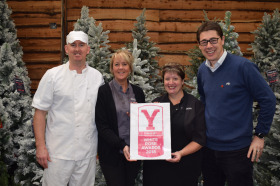 Steve Smith (Plants Buyer); Jackie Price (Catering Supervisor front of house); Sam Grainger (Kitchen Assistant); Diane Farrar (Tills Manager); Ben Hooper (Sales Assistant); Andy Pickering (Head Butcher) and Lee Parnham (Head Baker) will accompany some of the management team to the Welcome to Yorkshire White Rose Awards on November 12, where Tong Garden Centre is once again shortlisted in the Customer Service category. These staff were selected for their positivity and commitment which contributed to the exponential growth during a long, hot summer that saw huge demand for outdoor plants, garden furniture and fresh produce for barbecues. Tong's co-owner, Mark Farnsworth said: "Every member of our team works hard to surprise and delight our customers, but these staff members have gone the extra mile to deliver an exceptional level of service and we're looking forward to attending the awards with them." The Welcome to Yorkshire White Rose Awards honour Yorkshire's £8 billion a year tourism economy and are the largest celebration of tourism excellence in the UK. The winners will be announced at a glittering awards ceremony on 12 November at Harrogate Convention Centre.